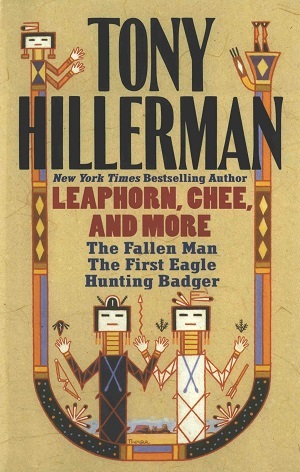 This is the first edition hardback of Leaphorn, Chee, and More. This is an anthology of three novels featuring both Lt. Joe Leaphorn and Jim Chee in the Navajo Mystery Series and include: The Fallen Man (1996), The First Eagle (1998), The Hunting Badger (1999). This edition was published in 2005 by HarperCollins Publishers in New York City, New York. The cover art was illustrated by Peter Thorpe and features two yei figures with a Southwestern landscape appearing between their bodies. The figures, title, and author are bounded by a long curved yei figure body. Format: Hardback, 23.5 x 16 cm. Binding: Brown boards with a red cloth spine.The author, titles, and publisher are printed in metallic gold on the spine.